TEXT Mommy's Home: Halloween is finished and I’m still living off the sugar rush. Halloween is finished and I’m still living off the sugar rush. At the beginning of September, my older son wanted to be a pirate. I was convinced that he was going to be a superhero but a little trip to the dollar store made him want to be a pirate. I should have bought the costume right then and there. It would have saved me some money and a bit of my sanity. Later that week we headed out to the Disney store and I asked him to try on the Jack Sparrow wig. It lasted about thirty seconds. He hated that wig. 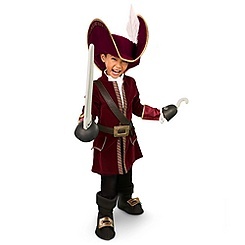 Then he pointed to the Captain Hook hat and asked to put that on so I let him try it. He wandered off to the mirror to check himself out, smiling all the way. When I asked him why he wanted this hat, he said it had a feather in it. Well I can’t argue with Captain Hook’s sense of style. It is impeccable. Then I looked at the price and HOLY hell, $60 for the outfit and $20 for the hat. WHAT??? I was about to have a heart attack right in the store. How can they ask so much for an outfit that he will wear once? Not to mention that I need to buy TWO outfits. Again I wonder if the people at these costume shops think I'm made of money. I was on a mission. I needed to find a cheaper solution. I headed off to the local fabric store and bought enough for a Captain Hook and a Peter Pan. They are young enough to have a theme, right? Then it began. The cutting, the sewing, the measuring for fit, the hot glue burns. 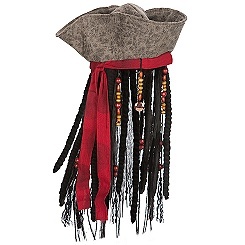 My visiting aunt gave me some money for the boys’ costumes so I bought the Captain Hook’s hat. That was way beyond my capabilities. In the midst of this flourish of fabric, I somehow lost some sanity and decided that a kids’ Halloween party would be an awesome idea. I could invite the kids from the neighbourhood and a few more. Clearly I was missing a few nuts and bolts or maybe I had sniffed too much hot glue to envision this plan. Twelve kids under the age of six were going to be at my home. I think my house looked a mess with all the Halloween themed projects. My inner Martha Stewart kicked in and I made spiders with pipe cleaners and pom-poms, candy bars wrapped like mummys, frozen bloody hands for punch and of course bats and spider webs covered every wall. On the day of Halloween, my hubby and I had to play catch up to very active boys. They didn’t have any candy and they were still super hyper and running to every house. I guess they don’t get out much. The haul was huge and my hubby and I are still enjoying their candy. My only hope is that I don’t get this crazy idea next year. Here are the boys with their homemade costumes. Cute Halloween pictures! We have tons of candy left, too, but I can't say I'm complaining!